Check out the Japanese flowers. MLJ features all Japanese flower spots and hanami as seasonable events. Check out Ume which is one of the most favorit flower for Japanese people. It blossom in eary spring. Learn how Japanese people watch Sakura, it called Hanami. From the midle of March to April, it's time for Ume(Plum). Then, it will switch to Sakura(Cherry Blossom) from the end of March to the midle of April (Note: It's depend on the wether and temparature). Ume has verious kinds of colors such as, red, dark red, white, pink and so on, has nice sweet smell. Many Japanese Gardern has Ume to decorate with those beautiful colors. Sakura has smilar colors, like white and light pink. In June, you can enjoy Ajisai and Tutsuji. MLJ features all kinds of flowers and their related events. 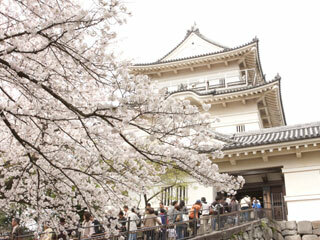 Odawara Castle(小田原城, odawarajo) is the one of the 100 best Hanami(花見) Spots in Japan. There are about 350 Sakura (桜,Cherry Blossom) surrounding the main keep and moat of Odawara Castle. At night, the castle and Sakura will be lighten up and you can enjoy great Yozakura (night sakura). There is Sakura Festival on the weekend, which you can enjoy traditional dance and music.